The Valois descended from Charles, Count of Valois (1270–1325), the second surviving son of King Philip III of France (reigned 1270–1285). Their title to the throne was based on a precedent in 1316 (later retroactively attributed to the Merovingian Salic law) which excluded females (Joan II of Navarre), as well as male descendants through the distaff line (Edward III of England), from the succession to the French throne. 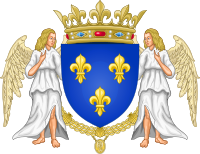 After holding the throne for several centuries the Valois male line failed and the House of Bourbon succeeded the Valois to the throne as the senior-surviving branch of the Capetian dynasty. Joan of Navarre, daughter of Louis X. Although Philip V had used his position relative to his niece to take the throne in 1316, Joan nevertheless had a strong claim as the heir-general of Philip IV and had been initially supported by her maternal family upon the death of Louis X. She ultimately received the Kingdom of Navarre, which could pass to and through females. In 1589, at the death of Henry III of France, the House of Valois became extinct in the male line. Under the Salic law, the Head of the House of Bourbon, as the senior representative of the senior-surviving branch of the Capetian dynasty, became King of France as Henry IV. Forms of address for Valois kings and princes included "Most Christian Majesty"." Dauphin" . "your Grace" . "Your Majesty" . "Most regal Majesty " . ^ Valois meaning, literally, "of the valley" or "from the valley"
^ Empress Matilda had claimed the English throne in the early 12th century. However her claim was contested by Stephen of Blois, occasioning a lengthy civil war, and Mathilda was not usually regarded as a legitimate monarch. ^ a b Anselme, Père. ‘’Histoire de la Maison Royale de France’’, tome 4. Editions du Palais-Royal, 1967, Paris. pp. 144–146, 151–153, 175, 178, 180, 185, 187–189, 191, 295–298, 318–319, 322–329. (French).